Start at the Lucky’s Supermarkets website and locate the “Lucky You Rewards” links. From there, click on the “Sign Up” option. Once your account is created, make sure you write your password down or memorize it. The website does not automatically prompt the browser to save it, so you may want to logout and login again, so your browser can record the password (if you like to use the browser for storing passwords). You will also receive an email welcoming you to the rewards program and saying that you scored 100 bonus points just for signing up. It also promotes their mobile app. You earn one point for every dollar you spend on qualifying products (see Exclusions segment below). The points are earned after discounts and coupons. You do not earn points on taxes. The points unfortunately are not forever, so this program benefits frequent shoppers or big spenders. Unredeemed points expire at the end of the month 90 days after they are earned. So this means points last from 90 to 121 days, depending on when you made a purchase. To get an actual reward, you have to convert your points into rewards. Once you do that, you have 30 days to pick up your earned actual reward at the store, otherwise it will expire. You won’t get the points back, so plan reward redemptions ahead of time! Once points are converted to rewards they cannot be converted back to points. Rewards must be redeemed (picked-up) in-store within thirty (30) days of conversion or the reward will expire. You can just use your phone number to earn rewards but to pick up a reward, you must use the app or another form that identifies you as you. 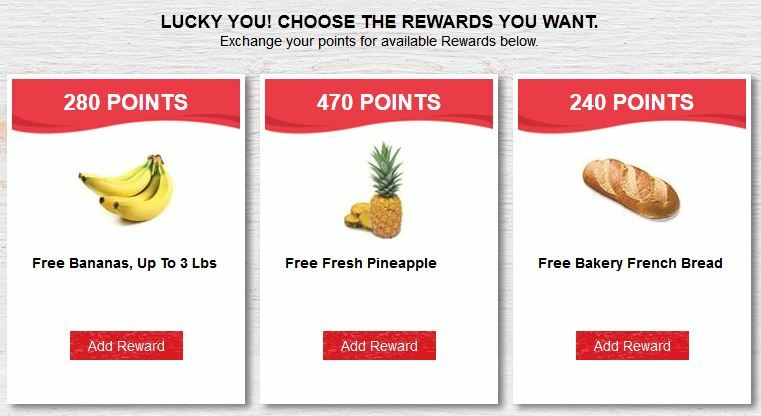 There is a variety of rewards, some of them are free products, for example, 820 points get you a free rotisserie chicken, or 120 points get you Morton Salt, or 180 points get you a Cliff bar. However, the more flexible rewards are the discounts. For example, 300 points get you $3 off your next purchase, 500 points get you $5 off, and 1000 points get you $10 off your next purchase. If you prefer to get an actual product, make sure you check the prices (if you are not already familiar with them). The dollar amount discounts are probably a better deal (and you don’t have to commit to a specific product). Since everyone starts with 100 points and there are four reward options between 110-120 points, all you need to do is spend around $20 and you earn your first reward already. But strategically you are better off saving it for that $3 off (300 points) reward. I do not know what the special and exclusive/personalized offers are yet (see last section below), but the standard rewards program is essentially 1% of your purchase. Not very lucrative, but if you combine that with credit card rewards, it adds up. This program is compatible with the SHARES program, so you can earn rewards and your favorite non-profit can earn points as well. As with most rewards programs, not everything is eligible to earn rewards. It is not a surprise that the usual suspects are EXCLUDED: booze, dairy, tobacco, stamps, gift cards and phone cards, money transfers and money orders, tickets (events and lottery), transportation passes, charitable donations, pseudoephedrine or ephedrine products, prescriptions, health tests, contact lenses or other pharmacy items or services that must be excluded by law. The list may be modified from time to time without notice to program participants. Keep in mind, if you are very sensitive or strict about how your personal and shopping data is used, any time you see “personalized” offers it means your data will be used in the cooking up of the personalized offers.